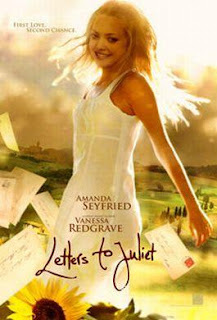 Summary: Plot Summary: When a young American (Amanda Seyfried) travels to the city of Verona, home of the star-crossed lover Juliet Capulet of Romeo and Juliet fame, she joins a group of volunteers who respond to letters to Juliet seeking advice about love. After answering one letter dated 1951, she inspires its author (Vanessa Redgrave) to travel to Italy in search of her long-lost love and sets off a chain of events that will bring a love into both their lives unlike anything they ever imagined. Thoughts: I saw this trailer a few months ago, and it looked like a good movie. A romantic movie of course! And I'm a big fan of Romeo and Juliet so that adds to my need to see it! I havent heard of this movie before, so thank you for telling me. Amanda is such a great actress and the movie sounds like a fun and romantic. Ooh, I love both Amanda and Vanessa and this movie sounds fantastic! Thanks for letting us know about it! I haven't heard of this one yet but it looks great-I love Romeo and Juliet remakes! I want to see this movie. I saw a trailer a few months ago and it caught my eye right away. I totally agree! I saw the trailer for the first time in theaters last November and I can't wait to see it! Oh I have never heard of this movie. It looks great! Thanks! I'm seen the preview for this- looks like a MUST SEE.